Canon Expo takes place every 5 years in select cities around the world. 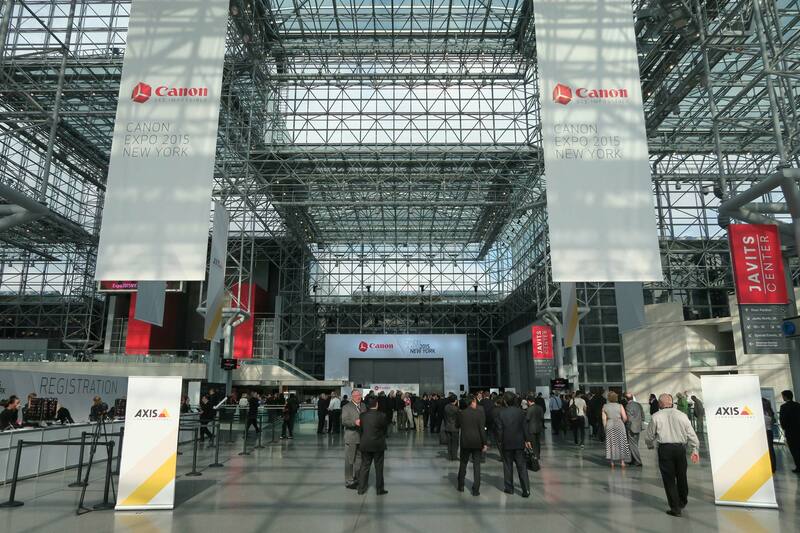 On September 9, 2015, Canon EXPO commenced in New York’s Jacob Javits Convention Center. Next stop was Paris: October 3-15, to be followed by Tokyo and Shanghai. There’s a virtual tour online. It was a wonderful display of new technology, science experiments, leading edge products and audacious concepts from Canon’s engineering teams. 100,000 square feet of exhibition space revealed an intoxicating mix of actual as well as proof of concept technologies in Canon’s many fields of imaging. At Canon Expo 2010, five years ago, we saw the concept of a new 4K camera that would take on a totally different shape and become the C300. This year, there was an APS-H-size (approx. 29.2 x 20.2 mm) CMOS sensor with 250 million pixels (19,580 x 12,600 pixels). Video on a Canon prototype camera in Paris showed lettering and detail on the Eiffel Tower 11 miles away. Resolution was approximately 125 times HD and 30 times 4K UHD video. We were treated to 8K displays and an 8K camera and lens. I would be surprised if this is the final form factor, or even the sensor size. Like the mountain-climber’s phrase, Canon sometimes does things because it’s there…or because they can. Please read the two interviews that follow — with Mr. Maeda and Mr. Okada — for additional insight. At Canon Expo 2015 in New York, I was delighted to speak with Mr. Masaya Maeda, Senior Managing Director and Chief Executive of Image Communication Products Operations, Canon Inc.
JON FAUER: Mr. Maeda, would you please explain what Canon Expo is all about? Especially for our readers who could not attend the event in New York. MR. MAEDA: First of all, I am in charge of all the exhibits at this Expo. Please, no congratulations yet. The event has just started. It’s amazing. Every five years, Canon Expo is better than the last. I remember at Canon Expo 2010, just five years ago, you introduced a 4K concept camera. It looked somewhat like a plastic hairdryer. Here we are, five years later, and you’ve already built thousands of 4K Cinema EOS cameras, and now you’re introducing an 8K concept camera. Oh, thank you. What did you like at this year’s Canon Expo? My favorite exhibits were the 8K camera and 8K projection of “The Ride.” I also loved the museum reproductions with textured printing. You could actually touch a painting that you’re not allowed to do in a museum. Normally you would be arrested if you tried that somewhere else. 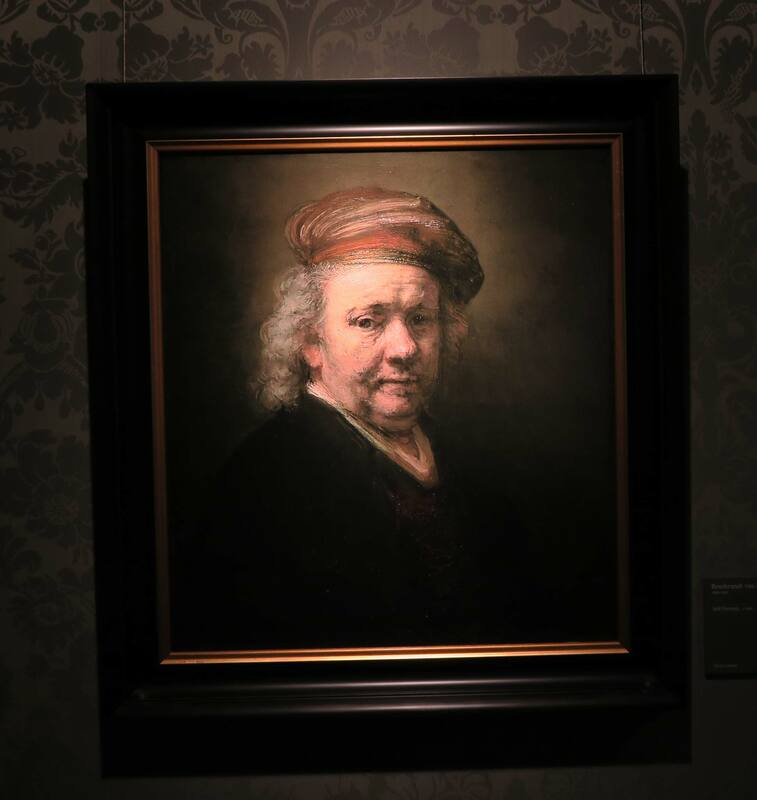 I’m flying to Amsterdam tomorrow and I won’t dare try that in the Rijksmuseum. This is, I think, the only place where you can actually touch the famous paintings. Let me first talk about the overview. The catch phrase for Canon USA is “See Impossible.” From our headquarters in Japan, we were thinking about three topics. The first one was the 8K camera, the displays and the projectors. What we were aiming for was to exceed the previous high resolution, high pixel standard. We wanted to redefine high image quality. The second point was the expansion of our service business and our production printing. Printing of the famous paintings, that we mentioned earlier, is what I like to call “Two and a half dimension printing—2½ D printing”. And the third point was for Canon to expand the B2B business in other areas, for example, medical and cinema. That was the overall concept. But now, let’s mainly talk about video and imaging, which is what I think interests your audience. One major thing that I would like everyone to see is how we have further strengthened the linkage between input and output devices. The input devices are cameras, including, of course, the 8K concept camera. Output consists of the new inkjet printers, our 8K monitors, and other projects now underway. We would like to exceed our previous benchmarks of high quality and we think that we have been able to achieve that on the output side with our printing and projection systems. That’s our focus — but what do you think? At NAB you said that it’s a challenge how far we can go in dynamic range and sensitivity using current APSC or Super 35 sensors. I think you suggested that a larger sensor size might be more advantageous because of the larger pixel pitch. And yet, the 8K camera that I saw here was still Super 35. That must have been quite difficult to do. Would you like to comment? We will continue to expand dynamic range and sensitivity going forward. But yes, we do have this topic of competing requirements: having to increase the number of pixels, the sensitivity and dynamic range—all at the same time. In order to achieve these competing issues I think the basic thing we need to do is to increase the pixel capabilities of the CMOS Sensors that we manufacture. Does that mean it’s possible to get quality images from smaller pixels that are more sensitive than they are now? Yes. The number of photons are limited, but by increasing the capability of each individual photosite, we think we can achieve higher quality. However, I prefer larger photosites because they have more room for extra capabilities. And also it can be done with a simpler imaging process. And the end result is a better picture. I saw your 120 and 250 megapixel concept cameras with APS-H size sensors. Is it a law of physics that sensor size determines sensitivity or are you changing the laws of physics here at this Expo? Well, basically we are following the laws of physics, so the bigger the sensor, the better the sensitivity. But one of the technical features that we are working on is to try to increase the electrical conversion capabilities for the photosites. With that in mind, how do you see the motion picture business evolving for Canon? I remember when you launched Cinema EOS and the C300 at Paramount in November 2011, you described a pyramid of cameras. The top of the pyramid had a question mark. Are we getting there? Yes. Unfortunately, at this time, we have not come out with the top, high-end, most advanced camera that you have been hoping for. We are continuing to work on developing such a camera. But on the other hand, the C300 series has been a huge success. And Canon has sold more than 110 Million EOS lenses. Which brings us to the next question. Is the still camera market changing for Canon? For cameras with interchangeable lenses, mirrorless cameras, and middle to high-end compact cameras, those categories see a gradual improvement and increase in 2015 and going forward. If you just want to take a snapshot, most people now are satisfied with their smartphones. But I think everybody has a desire to take better movies and stills. People will always want to take high quality pictures and the cameras I mentioned earlier will continue to see a gradual increase. And what about DSLR with optical viewing compared to mirrorless EVF viewing? The electronic finder and the optical viewfinder both have their own good points. The mirrorless camera and the DSLR will continue to coexist with each other, having their own specialized characteristics. Both types of cameras will continue. Getting back to motion pictures. A big debate in our industry is whether there will always be a high-end, this top of the pyramid, or is there going to be a race to lower and lower prices? Personally I think there will always be an elite high-end but not everybody agrees with me. I think the top of the pyramid will definitely remain. We want to focus our best technology on that top of the pyramid and always try to develop the best camera. I think that you are still thinking Canon does not have a top-of-the-pyramid camera. The C300 Mark II is almost up there. But aren’t we waiting for the very top of the pyramid camera, not yet announced, that’s coming next? Some day in the future. We want to come out with the top-of-the-pyramid camera that some day in the future will satisfy you. Yes, but we have our EF lenses which are major assets for us. And so we want to come up with a camera that makes use of these lenses. I guess that means Canon may develop more and more Cine lenses as well? We also want to expand into that area. Do you think a similar philosophy may extend to the manufacturing of lenses? If there’s a push to try to lower costs, is it possible to have high-end Cine lenses that cost less than the ones we have now? Is it impossible? I think that’s possible. At least we will take on that challenge. This is true of cameras as well as lenses. What if it’s not possible to make the high-end less expensive, or maybe there’s no need to make them less expensive? For example, a Mercedes or BMW car is always very expensive. They don’t try to make it cheaper. Maybe it doesn’t matter what the cost is? We are not trying to destroy the pricing but rather, if possible, we would like to offer a high functionality lens at a reasonable price in the future. We have a large variety of EF lenses. They are a great asset. If we use this as our base, we think there is a possibility in the future that we can come out with high performance lenses with reasonable prices. To achieve this, we feel we need to further elevate our lens manufacturing technology. I’m not talking about automation in terms of mass production, but rather more like semi-automatic lens processing, lens grinding and polishing. You often describe things poetically or philosophically, about filming black crows on a moon-less night. Or comparing a fine wine. Where is Canon going poetically? I think that Canon Expo 2015 got off to a very good start. I think we were able to make progress from different perspectives. It seems that 4K was just an intermediate point and that you’re already reaching for 8K? Yes. I like to say that I want to be able to expand the area in which the camera can actually capture images. I feel this year we were able to advance another step further. If you compare it to wine, I think that this would be comparable to the year 2002 which was, as you know, a good harvest year for wine. In the near future I would like to achieve a year in which we will see a lot of evolution and progress similar to the wines from the year 2005 which had a very exceptional harvest. And this year, 2015 is indeed a very good year for Canon. A few months earlier at NAB , I had the pleasure of meeting with Mr. Masato Okada, Deputy Chief Executive Officer of Canon’s Imaging Communication Department. 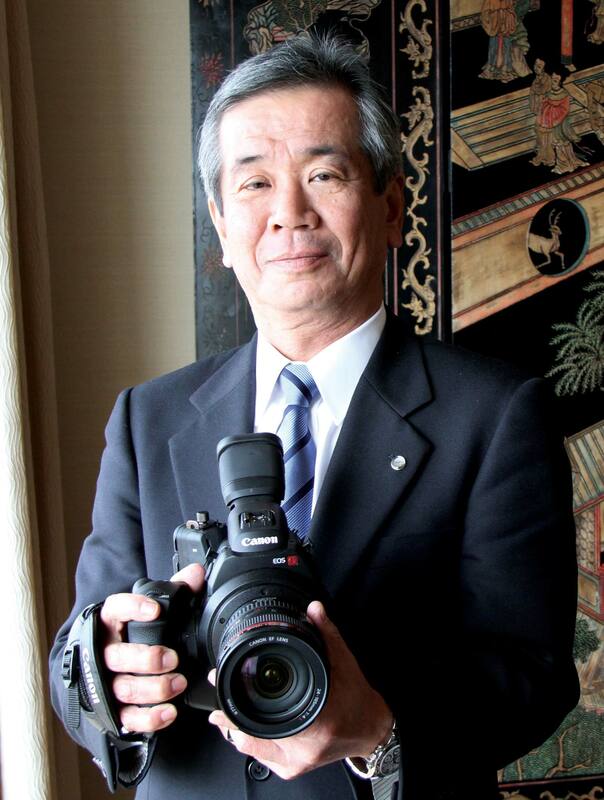 Basically, Mr. Okada is in charge of lenses at Canon. JON FAUER: Mr. Okada, thank you for inviting me to talk to you. Can you please tell us a little bit about your career, what you studied in school, and how you got started at Canon. 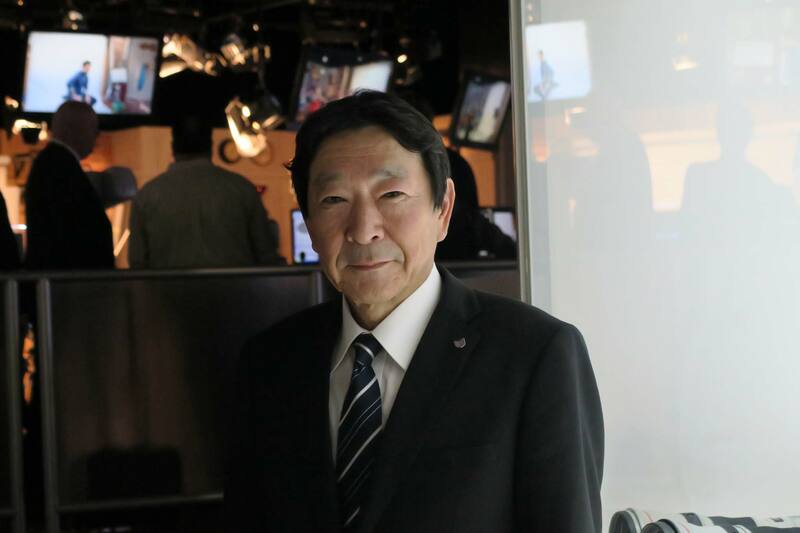 MR. OKADA: I majored in mechanical engineering at the University, and then I joined Canon. Initially, I worked at the lens factory–in the technical section. After that I became the Director of Manufacturing. And in 2003 I joined Canon headquarters. When you were working at the lens factory, was that in Utsunomiya? Initially I was at the Tamagawa plant. We moved the lens manufacturing to Utsunomiya in 1982, and I moved with the factory. I was born in Kyoto. In the countryside. Did you study optical engineering in the University? I majored in mechanical engineering, and I was mostly focusing on automation. What are your responsibilities at Canon now? I’m the person who is basically responsible for all the optics at Canon. EF lenses, AF, telescopes, DSLRs, finder optics, camcorders, compact cameras, medical products, copying machines, optics for laser printers, and so on. Optics for both still and motion imaging? Yes. The lenses aren’t that different between the two areas. In Hollywood, when an executive approves a movie, it’s called “greenlighting.” Are you the one who “greenlights” whether to build a lens or not? For specific products, I’m the person who “greenlights” production: for example EF lenses and telescopes. Although I do manage the entire optics section, there are managers for each of the divisions, and those managers will be greenlighting the separate products. What are some of the exciting new products that you’d like to talk about? At NAB, we announced the XC10 and the C300 Mark II. Another recent product from our division was the 11-24 mm rectilinear zoom lens. Let’s talk about the XC10. The lens technology in it is quite advanced. Did that come from an existing still or video product? It was a completely new design. It’s 4K. Are the methods changing on how you actually design and build lenses now? In terms of our design approach, that hasn’t changed much. In this case, it was going to be 4K with a 10:1 zoom range, and we needed to decide what the maximum aperture would be. Based on those specifications, our designers tried to make it as compact and advanced as possible. When we say a lens is 4K, are still lenses 4K? There are three different types of lenses. There are the EF lenses for the full frame and APS-C DSLR cameras. For those lenses, the resolution is actually more than 4K. The 5DS camera that we introduced is a 50-megabit camera. It benefits from lenses that have even more resolution than 4K. Our EF-M lenses are the ones that are used on our mirrorless cameras. (EF-M lenses have an 18mm flange focal distance. EF lenses have a 44mm flange focal distance.) The sensor resolution is anywhere from 20 megs to 50 megs for this size. So, 4K means eight megs. So the resolution of these still cameras is much higher than that. With all these new cameras and lenses, do you find that the business is changing, in terms of customer demand? Is DSLR still increasing? Is mirrorless increasing? And where is the business going for still cameras? The mirrorless camera growth really depends on the region. In some countries of Asia, mirrorless is about half or higher but in the U.S., the ratio is lower and the majority is still built on the DSLR business. The U.S. is one of the most advanced nations in the world. I think that Americans are traditional in some regards, as well. Please tell me a little bit about what’s new in building lenses. Are there new technologies that make it possible to do what couldn’t be done before? There have been many improvements. The optical design software itself has also been evolving. We have our own proprietary design software. Some companies would use general design software that’s available in the market. However, compared to that software, our proprietary software is much more difficult to use. If you buy a common optical design software product off the shelf, that’d be like driving a sedan. And using our software is like driving a Formula One vehicle. Our optical design software is updated every year. It is a tool that has been evolving. We continue to raise the bar on the performance hurdles that we have set for ourselves. So we have improved our software as our designs have evolved in order to achieve what we’re aiming for. For the mechanical parts of our lenses, we use 3D CAD software. 3D CAD has improved quite a bit. We can simulate a drop test. Previously, we would take a video clip of dropping a real camera. Now we can simulate that test. We don’t have to build a prototype for drop tests because we can determine whether it can withstand a drop by doing these simulations. We can speed up the design process by doing more simulations and fewer prototypes. And the speed of design has also increased because we use a supercomputer to process the data. Our optical tools, mechanical tools, as well as simulation technology have improved. As a result of all these improvements, the level of reliability, as well as the optical performance that we’re aiming for, have been increased. Are you doing optical as well as mechanical simulations to reduce the number of prototypes? Yes, it’s the same with optics. We can simulate how optics perform on a particular camera. We can simulate the low-pass filter, the CMOS sensor and the image processors. And we can actually print out an image as if it actually had been shot by a particular camera with those lenses. We still continue to make samples to check the quality and performance of the final product. But a great deal of our design approach is prototype-less. We actually can do a lot more by not creating many prototypes. That saves us time and it makes us more efficient. We can now simulate internal refraction, ghosting, flares, and so on. Our software can determine what a shot might look like with the sun right there in the shot, for example. So we no longer have to test with a physical prototype. For motion picture cameras like the C300, are you selling more with PL mounts or more EF mounts? Generally the EF mount is a larger market. It probably has to do with the options, as well. We have 97 different types of EF lenses, and only a few types of PL mount lens. More than 110 million EF lenses have been sold. I think that may have something to do with it. Thank you very much. This has been very interesting. I hope to see you at InterBEE 2015. Very interesting article. Obviously there´s a top of the line (c500 MKII ?) camera missing in Canon´s line up. The frame rate limitations (not cropping) on the C300 MK2 and the lack of onboard raw recording makes me think that there has to be a better model coming soon. From what I´ve seen the C300 MK2 make really pretty images. The crop limitation when shooting high speed is a major issue. I wish that at least you´d be able to shoot 120fps full sensor at 2K. 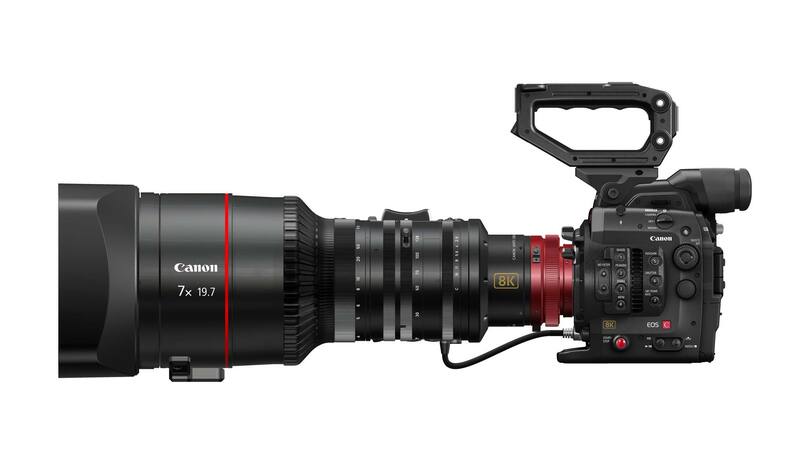 IMHO, if Canon wants to rival with Arri and RED they also need to get into the anamorphic train. Not sure about the success anamorphic lenses might have in the Canon EF photo world.